During the Renaissance, painting a ceiling was common place. Most ceilings were transformed into trompe l'oeil murals. During the most recent years the ceiling has been forgotten and taken for granted. 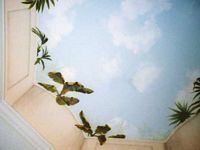 However with the rise in the popularity of the decorative arts, such as faux finishing and trompe l'oeil, the ceiling is fast becoming the most popular focal point in a home. Home owners are fast becoming aware of the fact a ceiling can and needs to make a visual impact to whoever enters their home. By creating an illusion with trompe l'oeil and faux finishing you can bring new dimensions to you home. The ceiling which was once the largest unused area of your home can now be given the attention it deserves. "The Fifth Wall"...The new accent wall! The ceiling in the faux finishing industry has become know as the "5th wall"
With the more open floor plans today, walls seem to go on and on, not ending at a corner anymore. So what used to be an accent wall isn't as common as it once was. The ceiling has become the new accent wall. Probably at least 60%-75% of a faux finisher's work today is done on a ceiling. You can get a lot of bang for the buck by addressing the ceiling. 4 walls vs 1 ceiling and the room looks completely dressed out. We seem to be doing a lot of textures and relief stencils. Design ideas come from the furnishings, flooring, and draperies. 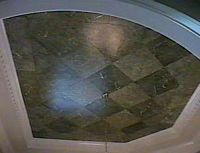 A faux treatment on a ceiling also will bring your eye upwards to other architectural elements such as crown moldings (which can also have a faux treatment if necessary). Trompe l'oeil Medallions or beautiful stencils can sometimes be enough around a chandelier or ceiling fan to finish off a room. 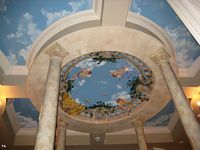 With murals we are asked for trompe l'oeil's with skies to open up a room. We do alot of trompe l'oeil stain glass designs and wrought iron. 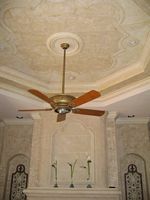 Designers and decorators seem to consider color and texture mostly in a ceiling treatments. But in the end the budget always plays the biggest role. ©Copyright 2002 Art Effects. All Rights Reserved.